Supra Stacks “Scout” colorway is ready to shred, so all the Vegan Skateboarders can earn their Vegetable Shredder merit badge. Scouts Promise. They also match your Dockers. 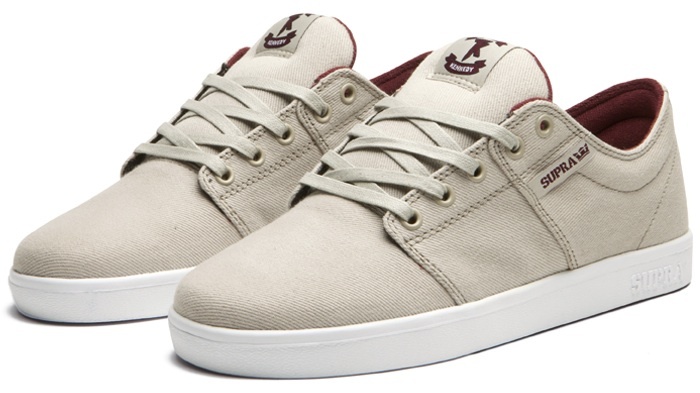 The upper is a canvas twill in ever so fancy khaki accented ever so regally with maroon. Lots of padding in the tongue and a little in the collar. The cupsoles are light weight so give some protection but still have good board feel. Did I mention these are available in foot sizes tiny to gargantuan.